They might be tricky to finally get into your pack or vest, but they are also somewhat predictable. If you know the area you’re hunting relatively well, you should be able to pinpoint where they are at certain times of the day. Once exception to that rule is when the weather starts to shift on you. We’re talking about ruffed grouse hunting in the rain. Yep, you’re going to get soaked but if you have limited time over the weekend hunting grouse in the rain may just be worth it. If you’ve ever walked through the woods when it is raining (or even shortly after its done raining for that matter) you know what I’m talking about. Just brushing past a single branch will send what feels like the entire rainstorm at you all at once. Now go ahead and add the type of thick cover that grouse like, and it won’t be long before you’re absolutely soaked. Everyone is going to have different preferences for this, but if I’m ruffed grouse hunting in the rain I prefer to actually dress relatively light. When your clothes soak up all that water it’s going to end up weighing you down big time, and in my opinion wet clothes really don’t do much to keep you warm anyways. If you keep moving it should be enough to keep you relatively warm, so dress light so you can stay mobile. It sounds cliche, but the biggest part of any type of hunting is simply returning home safe & hunting grouse in the rain is no different. Make sure you bring a change of clothes & keep a thermos of something warm in your truck for when you’re done. You don’t want to get sick from just walking around in the woods! We’ve already touched on where they will be during certain times of the day & what kind of habitat they like, but when you’re hunting grouse in the rain it tends to throw a hitch into the normal game plan. Instead of transitioning out of their normal roosting areas to feeding areas in the mornings they will actually move towards stands of spruce & pine to attempt to stay dry. Like any sane living thing, grouse don’t particularly love getting wet. Where we can just duck inside to stay dry, they opt for spruce & pine trees if they’re available to at least keep from being rained on directly. If you can locate a younger stand of these trees (maybe head-height or a little bit taller), there is a very good chance you’re going to bump some birds. With as loud as ruffed grouse are when they take off during normal weather, it’s incredible how quiet they can be when you’re hunting grouse in the rain. The combination of the sound of the rain hitting the ground & trees and the fact that the grouse is also wet muffles the sound of them taking off tremendously. You’ll have to have your head on a swivel if you want to have a chance at getting a shot off. Grouse seem to be especially good (at least the ones we’ve encountered) at flushing on the opposite side of that spruce tree. You hear them go, but you can’t see them. If you’re hunting with another person, try to position yourselves so that one of you can cover areas the other person can’t see. Just remember to keep talking to each other so you know where each other are in this thick cover! 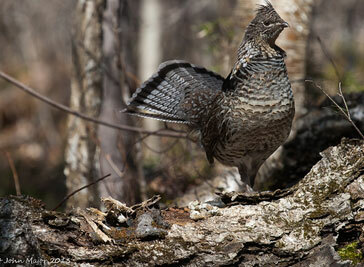 Like we touched on in our article about ruffed grouse hunting tips – stay ready with your gun in an easy position to get to your shoulder. It’s likely you’re going to have even less time to get a shot off than you normally would, so be quick!